A UK specialist in Oral & Maxillofacial Surgery, Oral Surgery and Oral Medicine, Peter Thomson first qualified in Dentistry, BDS (Hons) from Manchester University in 1982, and subsequently in Medicine, MBBS from Newcastle upon Tyne, in 1988. He was Lecturer in Oral & Maxillofacial Surgery at the Turner Dental School in Manchester between 1989 and 1996, during which time he undertook research into epithelial cell biology and oral carcinogenesis at the Christie Hospital gaining both MSc and PhD degrees. Peter obtained Fellowships in Dental Surgery from the Royal College of Surgeons of England and Ireland in 1990 and an FRCS from Edinburgh in 1992. Having completed his surgical training in Maxillofacial Surgery and Head and Neck Oncology, Peter was appointed to the Chair in Oral & Maxillofacial Surgery at Newcastle University in 1996. During his 20 years at Newcastle, Peter led both academic and clinical departments, was a founder member of the Northern Head & Neck Cancer Unit, and served as Clinical Director of the Newcastle Dental Hospital for 4 years. His principal clinical and research interests are in early diagnosis and surgical intervention for oral cancer and potentially malignant disease and he has published and presented over 250 research papers internationally. Peter is also an active clinical educator and has contributed to the development of oral surgical competency training for undergraduate BDS courses. In 2009 he was appointed Hunterian Professor at the Royal College of Surgeons of England and in 2011 a King James IV Professor at the Royal College of Surgeons of Edinburgh. 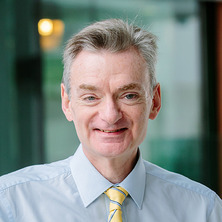 In 2014, Peter was appointed Visiting Professor at the National University of Singapore, and awarded a higher doctorate, DDSc from Manchester University, for his research work in oral oncology. In 2016, he was awarded an MD from the University of Bath for a research thesis on the interventional management of oral potentially malignant disorders. Peter joined UQ's School of Dentistry as Professor of Oral & Maxillofacial Surgery and Academic Clinical Director in April 2016. In 2017, he was appointed Director of the conjoint UQ/MNHHS Oral Health Alliance. Treatment resistance in potentially malignant disorders-'Nature' or 'Nurture'…? Building an Alliance: A new future for academic dentistry 'Down Under'? McCormick, N. J., Thomson, P. J. and Carrozzo, M. (2016) The clinical presentation of oral potentially malignant disorders. Primary Dental Journal, 5 1: 52-63. Oral precursor lesions and malignant transformation - who, where, what, and when? Thomson, P. J. (2015) Managing oral potentially malignant disorders: a question of risk. Faculty Dental Journal, 6 4: 186-191. Goodson, M. L., Sloan, P., Wadehra, V., Johnson, S. J., Robinson, C. M., Augbourg, G. and Thomson, P. J. (2014) Orcellex brush biopsy and liquid-based cytology -assessment of a new diagnostic technique in oral potentially malignant disorder management. Journal of Oral and Maxillofacial Surgery, . Goodson, M. L., Sloan, P., Wadehra, V., Johnson, S. J., Robinson, C. M., Mowatt AW and Thomson, P. J. (2014) Predicting clinical outcome following oral potentially malignant disorder treatment - the role of adjunctive diagnostic techniques. Journal of Oral and Maxillofacial Surgery, . Goodson, M. L. and Thomson, P. J. (2014) Tissue autoflorescence and the diagnosis and management of oral potentially malignant disorders. Journal of Oral and Maxillofacial Surgery, . Diajil, A. R., Goodson, M. L. and Thomson, P. J. (2014) Time to treat - treatment time does not adversely affect clinical outcome following laser excision of oral potentially malignant disorders. Journal of Oral and Maxillofacial Surgery, . In-patient operating exposure for dental undergraduates: a valuable experience? Oral lichenoid lesions: a significant diagnosis in oral potentially malignant disorder management? Thomson, P. J. and Goodson, M. L. (2016). Ageing and mouth cancer - developing clinically applicable tools to screen the 'high-risk' population. In: 6th International Symposium, McDonnell International Scholars Academy, Brisbane, QLD Australia, (). September 2016.